San Francisco, CA —June 8, 2017 — Blueshift, the leader in Segment-of-One Marketing, today announced the launch of its AI-Powered Cross-Channel Journeys. Unlike legacy systems, the new solution enables growth marketers to trigger cross-channel customer journeys based on AI-Computed Predictive Scores, as well as to include AI-Powered content recommendations at every step, using a highly visual and intuitive interface. Blueshift’s unique approach of combining behavioral data, AI & Automation in a unified product enables growth marketers to respond to every customer behavior with a 1:1 customer experience on every channel. According to a recent CMO Council Report, “one of the biggest challenges for marketers in 2017 will be understanding the connected customer journey across all touch points and how best to interact on a more personal, content-rich level”. Enter customers into journeys at exactly the right time and right channel, based on AI. In the past, marketers struggled to define rules that should determine when customers enter a journey. With Blueshift, marketers can use AI-Powered Predictive Scores to launch journeys at the perfect time for each customer. Insert AI-Powered Content recommendations at each step. With legacy systems, it is often hard to combine content-rich personal experience with automated campaigns. With Blueshift, the visual campaign builder is fully integrated with an AI-Powered Recommendation Studio for content & product recommendations, ensuring a content-rich 1:1 experience across channels. Marketers can even a/b test different types of recommendations. Track & measure campaigns in an intuitive manner. Legacy systems are unable to tie back attribution data and visualize the data at each step of the customer journey. 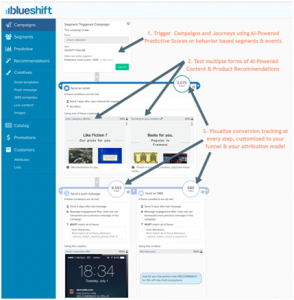 With Blueshift’s unique integrated approach, marketers can now select their own conversion metrics from any part of their funnel, customize their attribution models, and visualize campaign performance at each step. Early adopters of the solution include online learning leader Udacity. “We want to give our students a more personalized experience at every step in their journey. Blueshift’s new approach of combining behavioral data, AI and cross-channel automation in a unified product finally enables us to launch more direct customer engagement at scale,” said Kristy Ng, Sr. Manager, Digital Marketing. Another early adopter, UK’s biggest money saving app Vouchercloud, has used the solution to deliver more than 1 billion emails & mobile push notifications, with a small team of marketers. “Using Blueshift’s AI-Powered customer journeys, our small team has been able to deliver over 1 billion emails and push notifications across 12 countries. The messages are highly personalized with behavior-based, localized recommendations. In just 6 months with Blueshift, we’ve seen engagement rates climb to 40% and year over year direct email revenue has increased by 81%, far exceeding our expectations,” said Becky Spurr, Head of Communications, Vouchercloud. According to Luma Partners’ State of Digital Marketing, AI will move from the “edges” (narrow use cases) to the “core” to coordinate activities across channels. Blueshift’s AI-Powered Customer Journeys are the perfect illustration of this trend. “Legacy campaign management solutions have made it very hard for most companies to deliver content-rich & personalized customer engagement across every channel. With the launch of AI-Powered Customer Journeys, we are excited to provide growth marketers a new alternative today,” said Vijay Chittoor, co-founder & CEO of Blueshift. San Francisco based Blueshift is the leader in Segment-of-One Marketing. Unlike legacy campaign management systems offered by Marketing Clouds, Blueshift integrates behavioral data, AI & cross-channel marketing automation in a single system, enabling growth marketers to deliver 1:1 customer engagement on every channel. The company is backed by prominent venture capital investors, including Storm Venture Partners and Nexus Venture Partners.